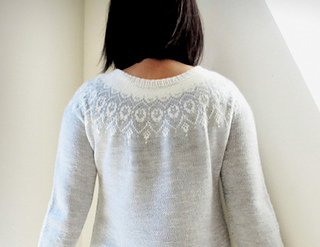 A seamless, round yoke style sweater knitted from top down in round. Increases are built in to colorwork design around yoke. 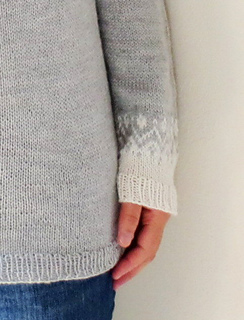 Sizes 30 (33, 36, 39, 42, 45, 48, 51), sizes are based on chest measurements of finished sweater in inches. 1 to 3 inches / 2.5 to 7.5 cm positive ease is recommended. 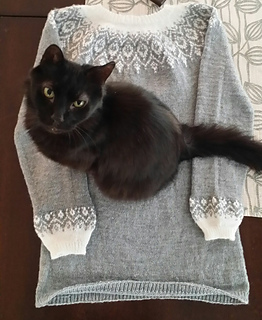 Sweater is modeled with 1 ½” / 3.75 cm positive ease. Note: if only one gauge can be achieved, it is most important to have correct gauge in stockinette stitch. 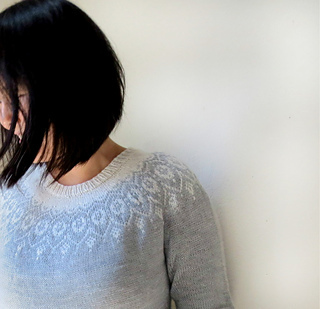 Sweater is knitted seamlessly from top down in round. Cast on for neck and work 1x1 ribbing, followed by colorwork around yoke. Increases are built into the colorwork chart of yoke. Work evenly to underarm. Leave sleeve stitches on waste yarn. Work body in round to hem with increases along sideseams. Work sleeves in round to cuff.